The drivers line up across the track from their mounts. Patrick Long. Patrick Pilet. Cooper MacNeil. John Oates. No less than seventeen Porsches sat across from them; vibrant, hardworking, diesel-powered machines. 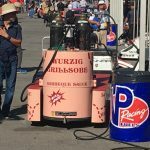 No, Porsche isn't looking to threaten Audi's diesel-powered endurance racing heritage; these racers are Porsche tractors. While tickover at this Le Mans-style start may have lacked the authoritative bark of a pack of 917s at La Sarthe, the tractors are still an important piece of Porsche heritage. With no more than four cylinders and outputs in the very low double-digits, these are machines ill-suited to setting lap records. 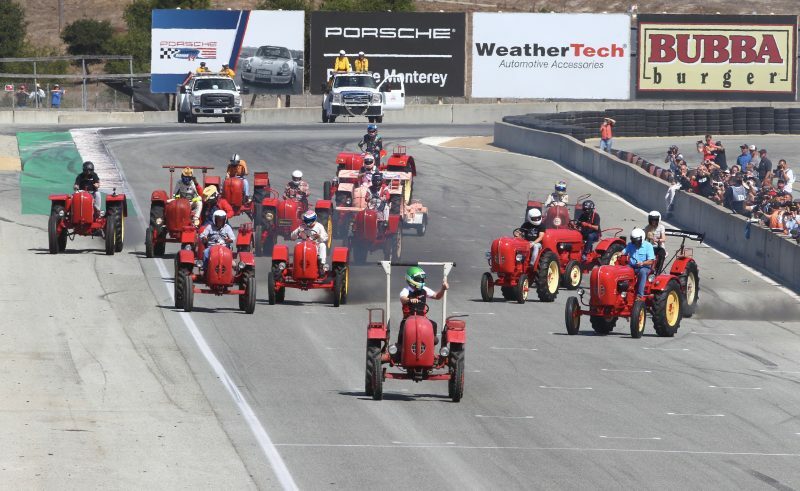 That did not stop the the first ever Porsche tractor race from being an exciting treat. Of course, the tractors featured were not just ordinary farm equipment. Several carried wings. Two had rollover apparatus (note: these appear to be owner additions, and not FIA approved). Clouds of black smoke indicated that these were not modern clean-diesels, but clattery, low-powered engines made just over century after the birth of their inventor. Urea injection or not, they were racing this weekend. Of course, they were air-cooled. Purists may rejoice. The first ever Porsche tractor race saw Patrick Long claim victory over the other 16 entrants, with Cooper MacNeil pushing from 15th to 7th position over the short race. Cooper reportedly tried shifting his tractor into neutral to gain speed in a downhill section, to no avail. Even in this illustrious field, one tractor stood alone. 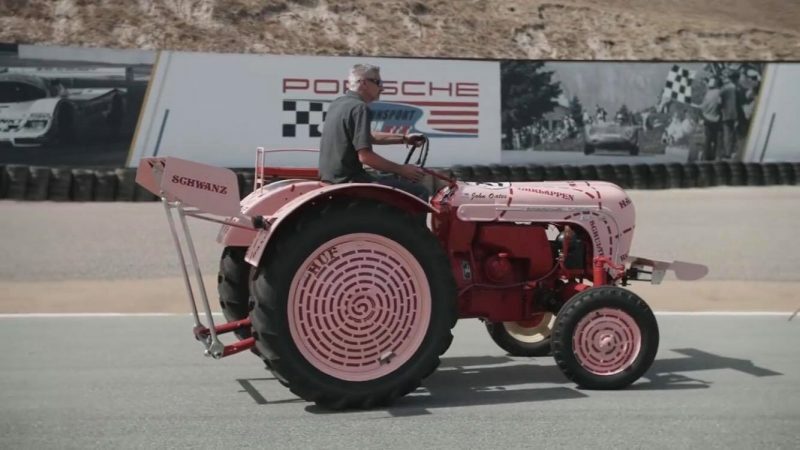 2018 is apparently the year of the Truffle Hunter, with the 911 RSR claiming a class victory at Le Mans, and now a Pink Pig themed Porsche Diesel tractor. 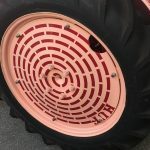 This 25 horsepower tractor features the livery of the Pink Pag racers, and was made for John Oates by Gunnar Racing. Though prohibited from racing a car for insurance reasons, John decided to join the action on a more modest machine. According to the singer, "you'd be surprised, I have several tractors on my farm in Colorado. I know what you can do with them!" We have a hunch that circuit racing isn't among Mr. Oates' normal tractor uses. Eagle eyed users may note that the Truffle Hunter tractor features something not seen on the 917/20 or the 911 RSR racer- active aero. Gunnar Racing added front and rear wings to the tractor. The rear wing uses the three-point hitch arms as a lower mount and allows the wing to be re-positioned by the driver while in motion. Given the top speed of the tractor we have a hunch that these wings are not particularly effective. 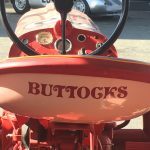 Here is a gallery, including a few of the hilarious details of the Pig, including its variable angle-of-attack aerodynamics. So funny, my tractor is faster. Actually Patrick Long took 3rd place. How do I know, we had our Porsche Junior Diesel (single cylinder) in the Saturday inaugural race over took and passed Patrick prior to the checkered flag. Eric Edenholm took 1st place with his four cylinder Porsche Diesel Tractor.